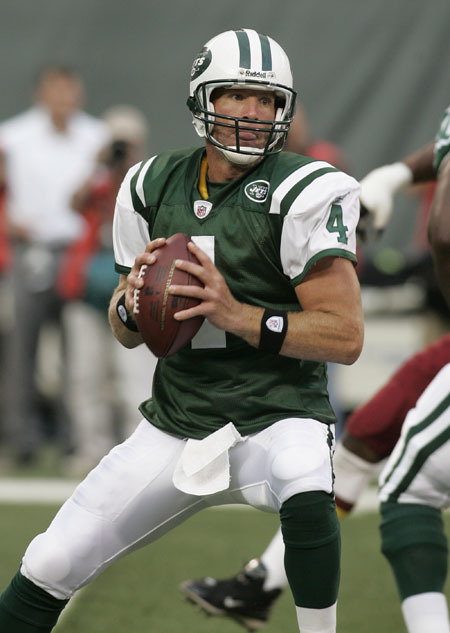 Brett Favre will he return next season with the Jets? Many of you are asking, “Will he come back, a Jet?”. The more I ponder this perplexing question, the tougher I realize this will be to answer. Understanding that Brett has always loved challenges, It is hard to see me walking away from the team, which he has made a contender, sculpting them only with his winning attitude and will to win. Brett Favre may also be feeling the stress of watching his family have to deal with all the criticism that in Green Bay he may not have dealt with on such a big town level. Deanna Favre in October of 2008 wrote on the Favre Hope Foundation blog about how she felt about such criticisms. The more I think about this, the harder this decision is. I can’t speak for Brett, but all I can say is I hope he comes back. Because for every 1 media moron that bombs him, 50,000 fans admire him. For every time someone doubts him, 1,000,000 believe in him. He is a game changing QB who still plays at a very high level, who can win a Superbowl for the New York Jets. He will never admit how important he is for this team, but I believe he is the glue that keeps the Jets machine moving forward. Without Brett would they even be in the Playoff hunt? I don’t think so. Yes, they have a great core of players, but the veteran knows how to keep the players up, and I believe his antics would be sorely missed, if he was to depart from that locker room. 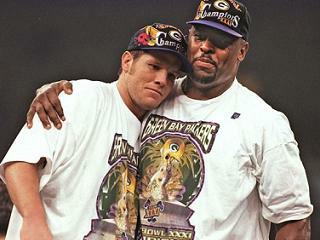 Reggie White and Brett embrace after a huge Superbowl victory! I know one thing, if the Jets don’t make the postseason, and the Media attacks Brett I believe he will retire. It is a shame, because this man still has the gift, and if the media isn’t careful, The NFL might lose a superstar and a perfect Role Model, who has let us in and shared with us his story. The Lord does not make QB’s or people like Brett Favre anymore, and we at Sportsroids want to salute him! Here’s to you Brett!